While not as strong as previous exhibitions such as NETWORKS (cells & silos) (2011) and Reinventing the Wheel: the Readymade Century (2013), this exhilarating show at the Monash University Museum of Art (MUMA) confirms that this is the premier public gallery in Melbourne staging intellectually stimulating group exhibitions on specific ideas, concepts and themes. There are some really interesting works here and I easily spent an hour and a half on each visit pondering, looking, thinking and inquiring. 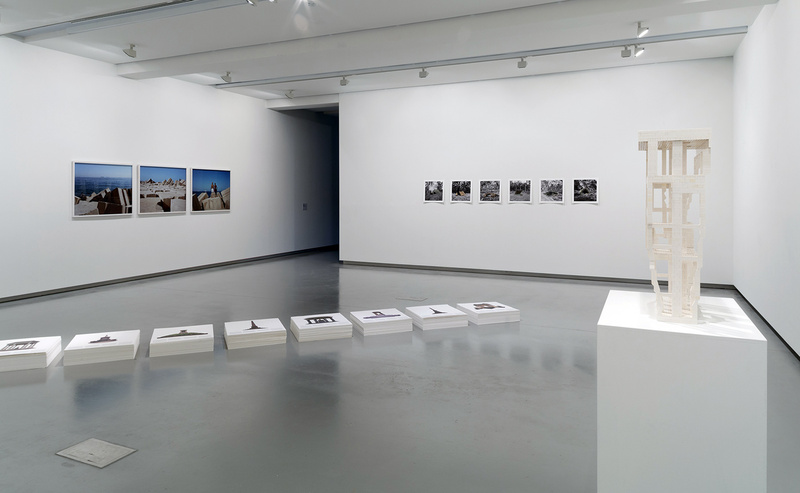 Some of the work is a little overexposed, such as Tom Nicholson’s Comparative monument (Palestine) (2012) – seen in Melbourne Now; Nicholas Mangan’s Some kinds of duration (2011), Ricky Maynard’s photographs and even more Callum Morton after his appearance in the Reinventing the Wheel exhibition. It’s about time some other local artists were given a go. Justin Trendall’s white Lego buildings are stunning; Laurence Aberhart’s war memorials are printed too dark and seemed to be neither a record nor a feeling (they looked so much better in the recently published book); James Tylor’s photographs are adaptive as they seek to place traditional Indigenous dwellings back into the landscape but the base photographs from which he is working are not up to much; Rä di Martino’s Star Wars ruins are just too cute; and Carlos Irijalba’s drilling/tides are fascinating, but only if you know the context from which the work emanates. 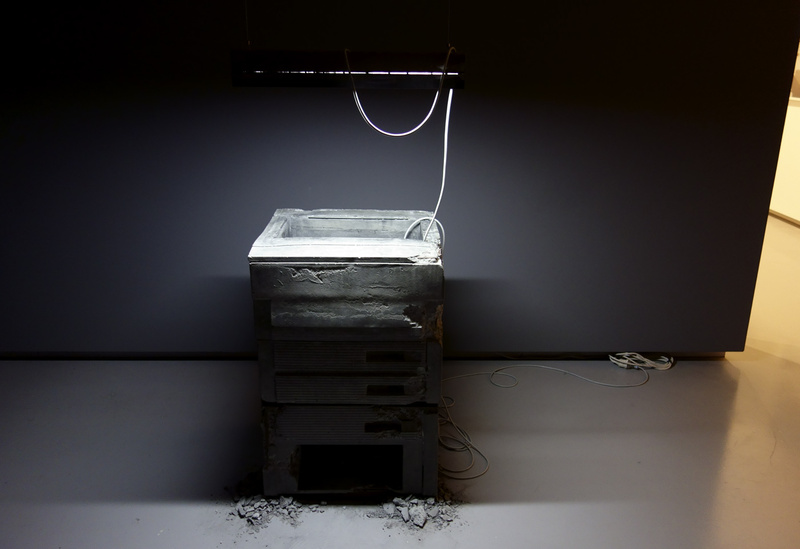 Video art was the highlight of the exhibition, and I don’t get to make that statement too often. 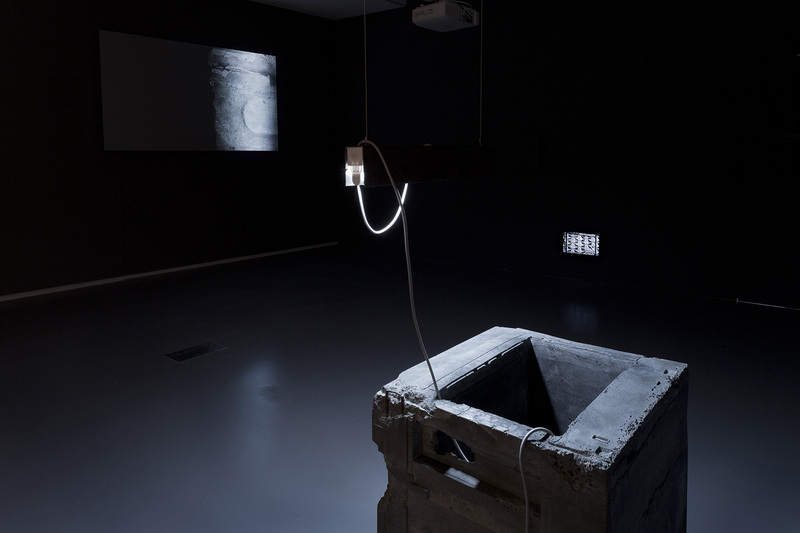 Igor Grubic’s film Monument (2014, below) was mesmerising, as was Jananne al-Ani’s Shadow sites II (2011, below) – two of the best pieces of video art I have seen in a long time. 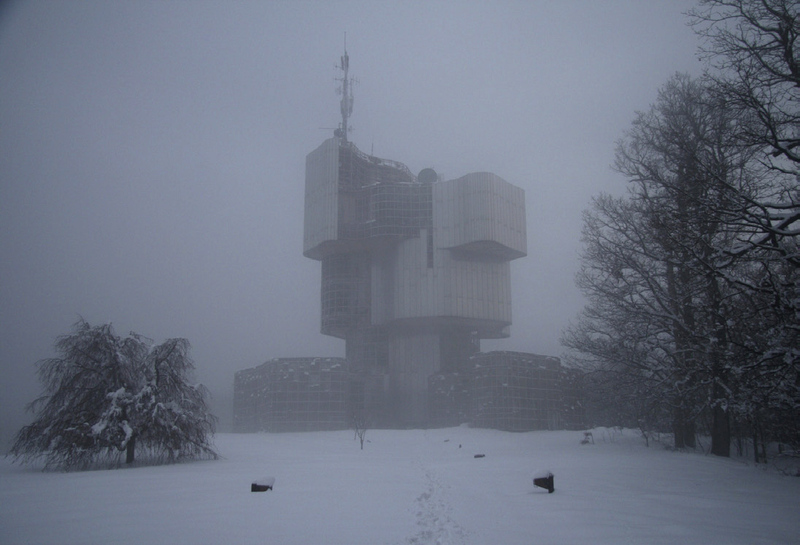 Monument features a series of meditative ‘portraits’ of the massive concrete memorials called ‘Spomenik’ built by the former Yugoslav communist state. Grubic abstracts these huge, cathedral-like memorials to various battles (usually of the Second World War) and events, instead focusing on textures, environments and seasons. He photographs the monuments in mist and accompanies the images with ambient soundscapes that are haunting and evocative. 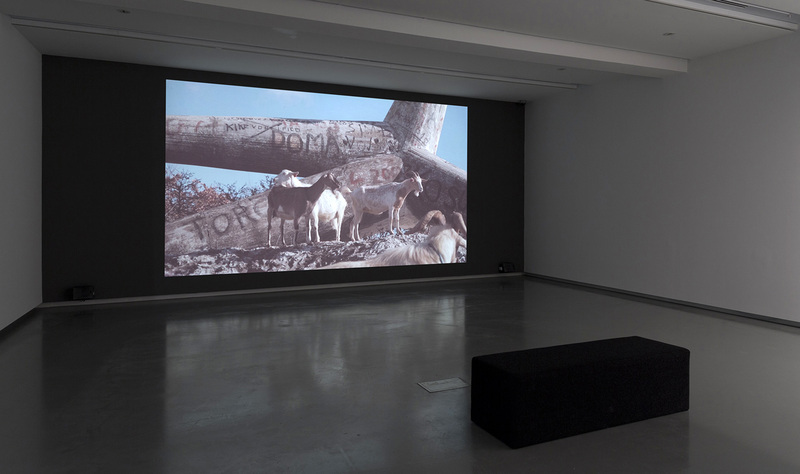 The film holds the viewer in the palm of its hand and you are unable to look away, as the artist’s camera scours the surface of concrete and steel, intercut with branches and leaves, angles and vistas, pulling back and pushing forward. Usually video art doesn’t hold my attention for all but a few minutes but this film you can’t take your eyes from. The screen flickers and crackles, fades to orange and back again – its almost like a failure of transmission, as though the signal is not strong enough to support these interstitial spaces. The other thing to note with this exhibition is that, like many contemporary exhibitions, there are no wall notes or even a hand-out at the beginning that would enable the casual visitor to gain insight into the nature and meaning of the works. If I had not read the press release and done my own research I would have had no idea about the origins of some of the concepts for the work. This really is not good enough for the casual visitor to the gallery, any gallery. Are visitors expected to spend hours before they arrive, researching what the work is about so that they might actually understand what is going on? I took a friend to the gallery and luckily I was on hand to explain to her the ‘how’ and ‘why’ of the works concepts and origins. For example, if you read the wall label for Monuments you would have no idea that these were in Yugoslavia and that they had mostly been built to honour the dead from World War II; similarly, if you read the wall label to Carlos Irijalba’s High Tides (drilling) (2012) you would gain only the vaguest idea that the soil drilling sample was taken from under the tarmac of a former weapons factory in the Urdaibai or Guernica Estuary, Basque Country. Guernica – that place of horror bombed in the Spanish Civil War and most notably memorialised in the painting by Picasso of the same name. We, the viewer, need to know these things… not as an addendum after hours of reading, or on getting home and reading the catalogue essay – but while we are at the gallery! 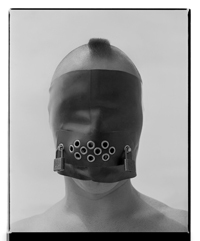 While artists hint at the meaning of a work, leaving interpretation open ended and up to the viewer’s imagination and what life history they bring to the work, it may be useful and indeed I think desirable to provide the viewer with some tangible clues. Not much, just a paragraph that they can take with them to help with interpretation. It’s not much to ask, is it? Many thankx to MUMA for allowing me to publish the photographs in the posting. Please click on the photographs for a larger version of the image. 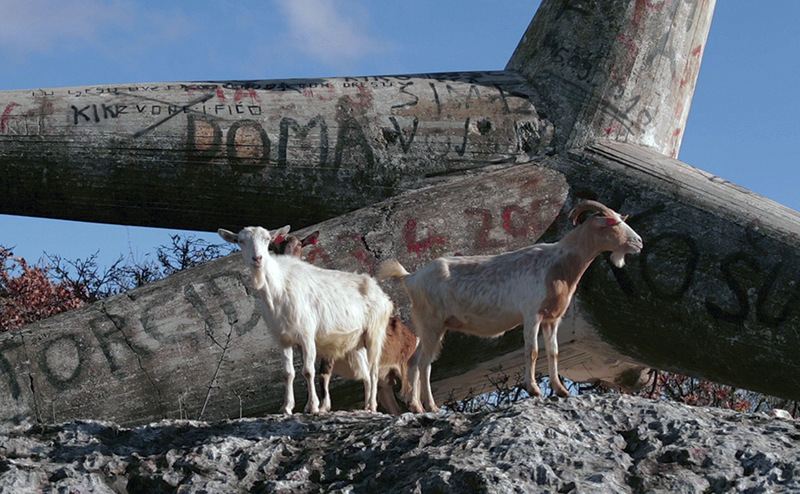 In the film Monument Zagreb-based artist Igor Grubic offers a series of meditative ‘portraits’ of the massive concrete memorials built by the former Yugoslav state. With the rise of neo-fascism these mysterious sentinel forms, originally intended to honour World War II victims of fascism, are increasingly subject to neglect, even attack. Emphasising the unexpected fragility of these monumental structures, Grubic sets human attempts to fix meaning, memory and the experience of loss against a backdrop of seasonal change. 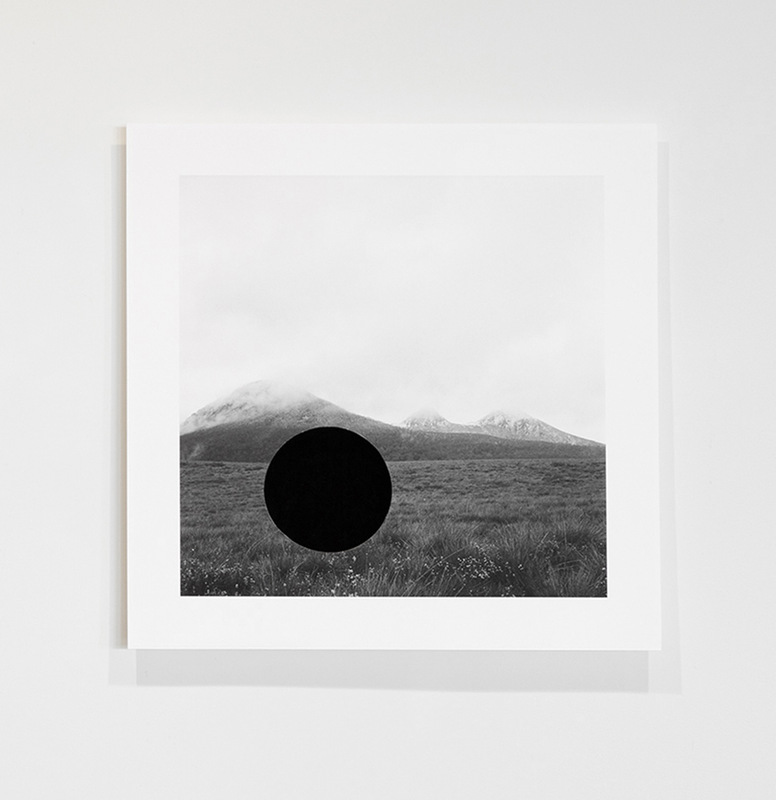 In a landscape which has witnessed so many cycles of trauma and upheaval, this work mirrors the rise and fall of many monuments built to preserve the memory of events which might otherwise be forgotten. Can such forms ever communicate a stable message through time? Jananne al-Ani’s film Shadow sites II offers a sequence of aerial views in sepia tones; second by second our perspective nears the ground. Our appreciation of the formal beauty of these images co-exists with our unease as we try to determine what it is we are looking at. 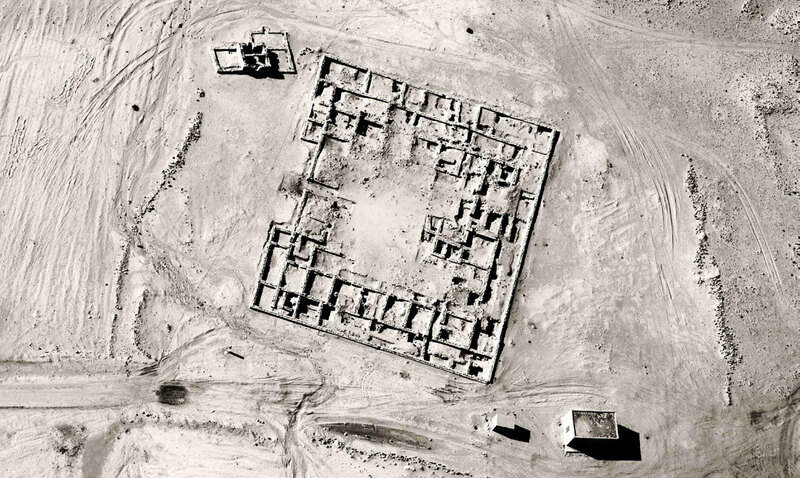 Are these archaeological sites, or housing compounds damaged by missile or drone strikes? Iraqi-born al-Ani notes as inspiration the ‘strange beauty’ of Edward Steichen’s 1918 photographs of the Western Front taken whilst he was a member of the US Aerial Expeditionary Force. Australian cities and communities feature a wide array of memorials, however the long history of Indigenous Australia is almost entirely absent from such solid forms of public acknowledgement. In Un-resettling James Tylor presents the beginnings of a formal typology of Indigenous dwellings, a number of which relate to his own personal heritage. 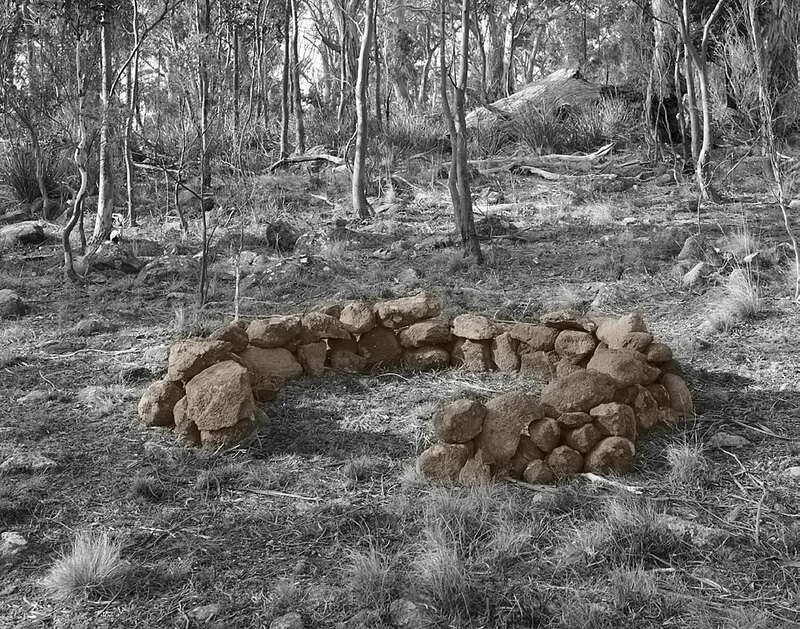 Tylor states, “Un-resettling seeks to place traditional Indigenous dwellings back into the landscape as a public reminder that they once appeared throughout the area.” Tylor’s photographs remind us of the invisible histories of this land, for instance the fertile volcanic plains west of Melbourne with remnants of stone dwellings and larger ceremonial sites of which there is little public knowledge. 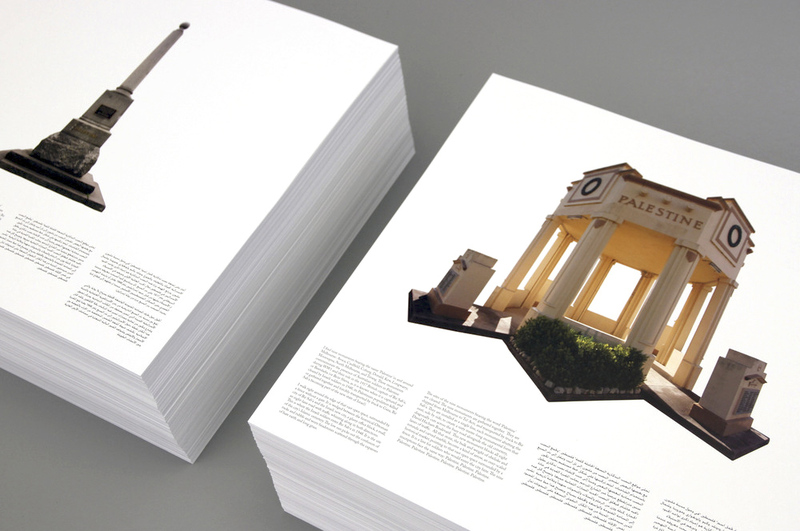 Proposition for a monument, articulated as 9 stacks of 1000 two-sided off-set printed posters, each 50x50cm, for visitors to take away, and also pasted up around Ramallah. 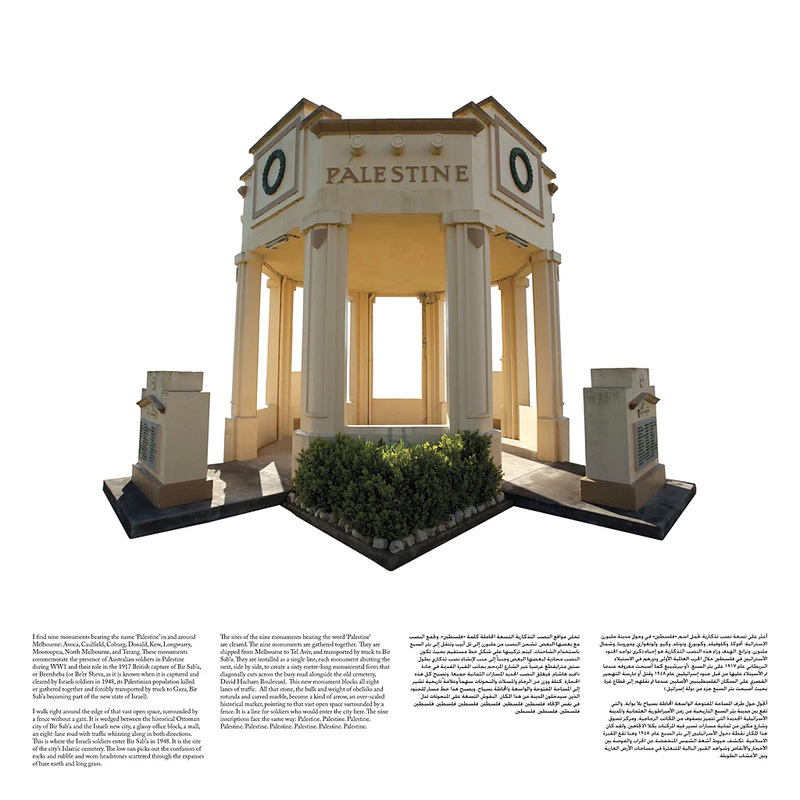 Comparative monument (Palestine) is a proposition for a future monument, which takes the form of nine stacks of posters, from which the audience is free to take a poster. The project began with a search for war monuments bearing the name ‘Palestine’ erected in and around Melbourne in the early 1920s to commemorate the presence of Australian troops in Palestine during WW1. 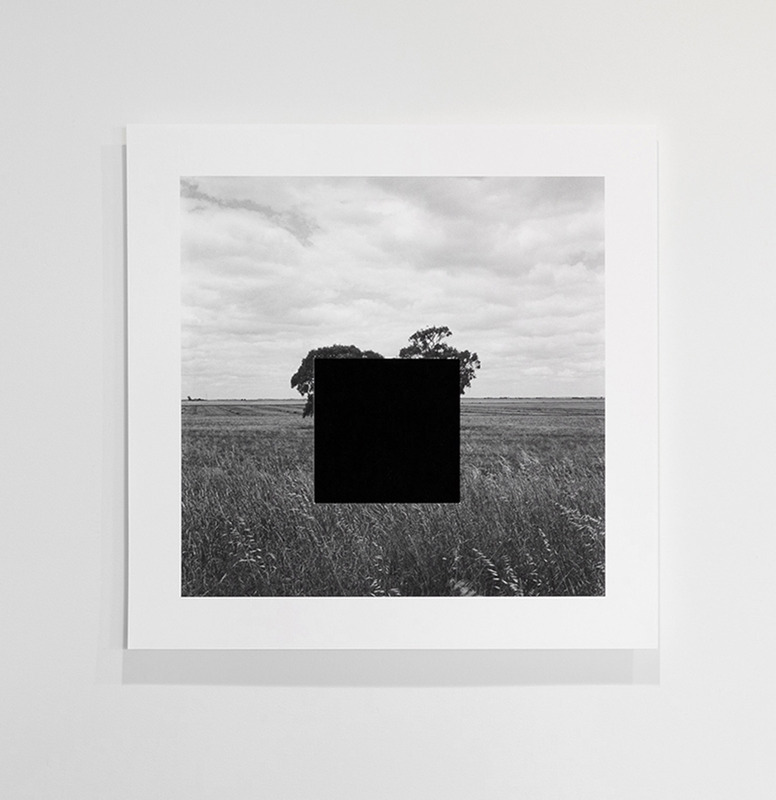 This project rethinks possibilities for the monument and suggests new forms of connection between different parts of the world and their histories. Throughout Australia, war monuments bear the name “Palestine” to commemorate the presence of Australian troops in Palestine during World War I and, in particular, Australian involvement in the 1917 British capture of Beersheba (in turn a critical city in the events of 1948 and the Nakba). These monuments also reflect the realities of the 1920s (when they were erected) and the era of the British Mandate, when the name Palestine implicitly invoked the shared position of Australia and Palestine within British imperialism. Comparative monument (Palestine) begins with a complete photographic record of these monuments bearing the name “Palestine” in and around Melbourne. 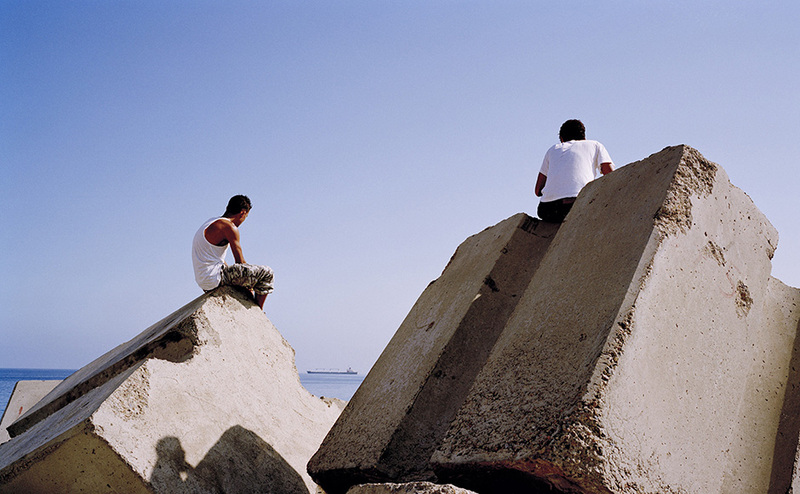 Figuring this material into a Palestinian context – both a kind of “homecoming” and exile for these Australian monumental forms – becomes a way to reanimate these linkages between Australia and Palestine. 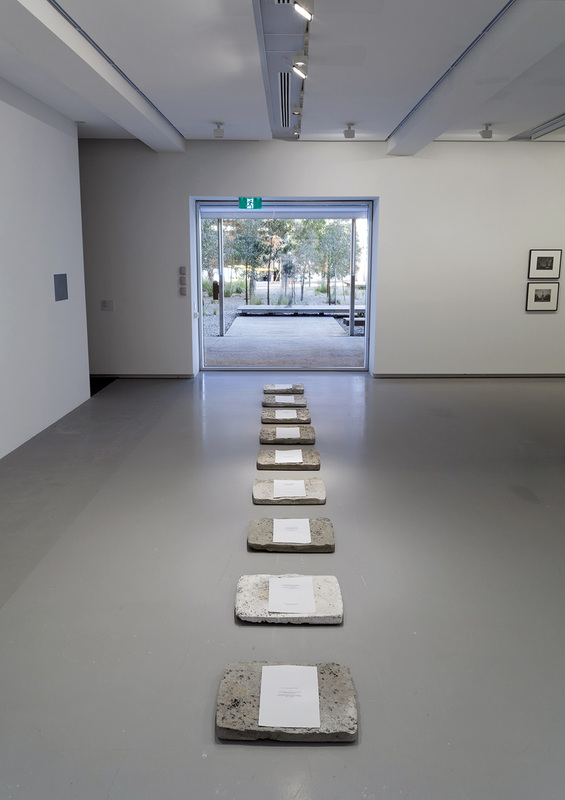 In these forms dedicated to 1917, Nicholson implicates the events and repercussions of 1948 with their echoes of Australian Aboriginal experiences of dispossession and colonial violence. 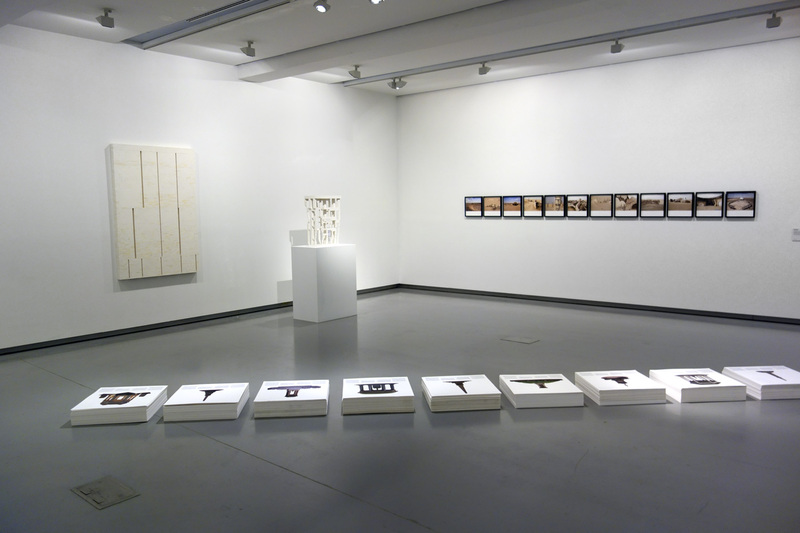 Comparative monument (Palestine) is an attempt to rethink the possibilities of the monument in the face of these histories of dispossession and the acts of imagination and solidarity these histories demand. 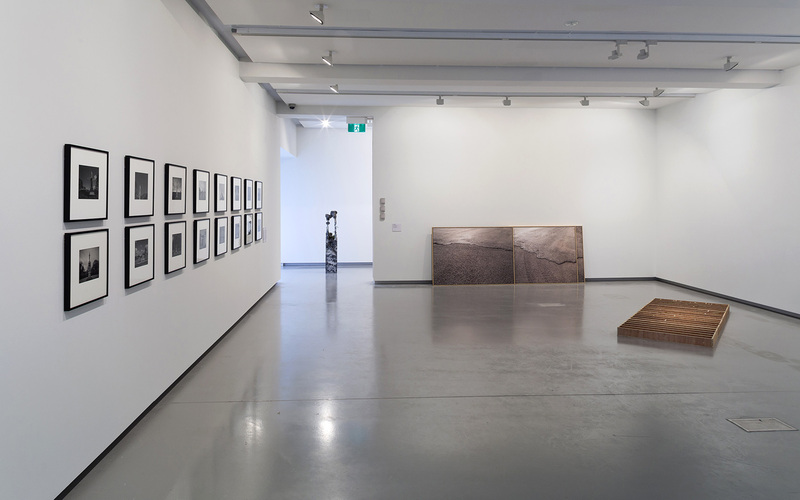 “MUMA’s second exhibition for 2014, Concrete brings together the work of twelve artists, both Australian and international. 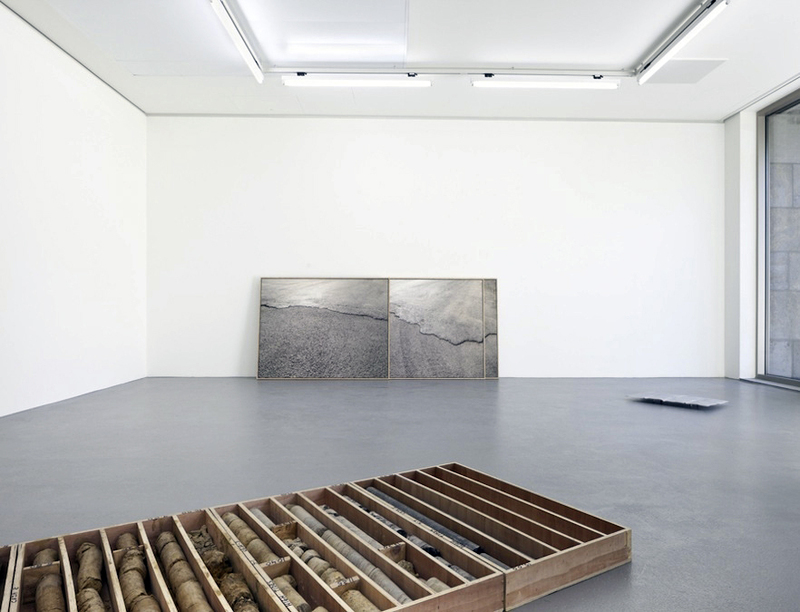 The exhibition explores the concrete, or the solid and its counter: change, the flow of time. As we prepare to mark the centenary of the First World War, the exhibition considers the impact of time upon built and monumental form, reading between materiality and emotion, form and memory. Monuments reflect a desire for commemoration, truth, honour and justice. Equally, they may function to consolidate political power and national identity. 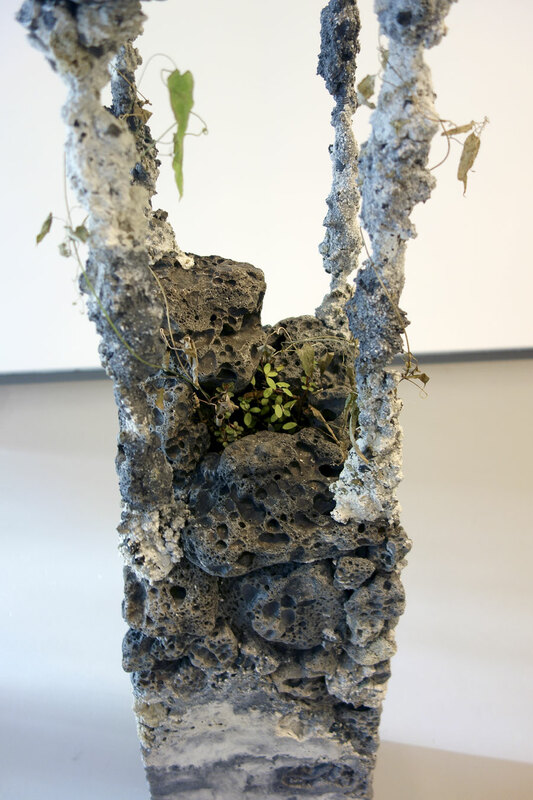 Works in the exhibition locate the monumental in relation to longer cycles of construction, displacement and erasure; archaeology, geology and palaentology; the shifting politics of memory and ways to describe a history of place. 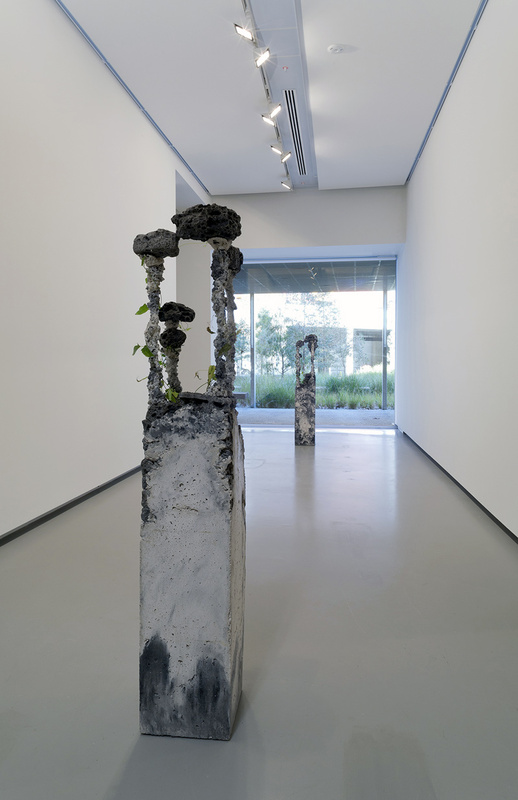 High Tides (drilling) by Carlos Irijalba presents a 17 metre drilling core from the site of a former weapons factory in the Urdaibai or Guernica Estuary, Basque Country. Beneath an asphalt ‘cap’, layers of soil, clay, limestone and the sedimentary rock Marga are evident. The bombing of Guernica is remembered for its devastating impact upon the civilian population and was the subject of an iconic painting by Pablo Picasso. Irijalba offers a window into the history of this place, as well as longer geological measures of time and materiality. 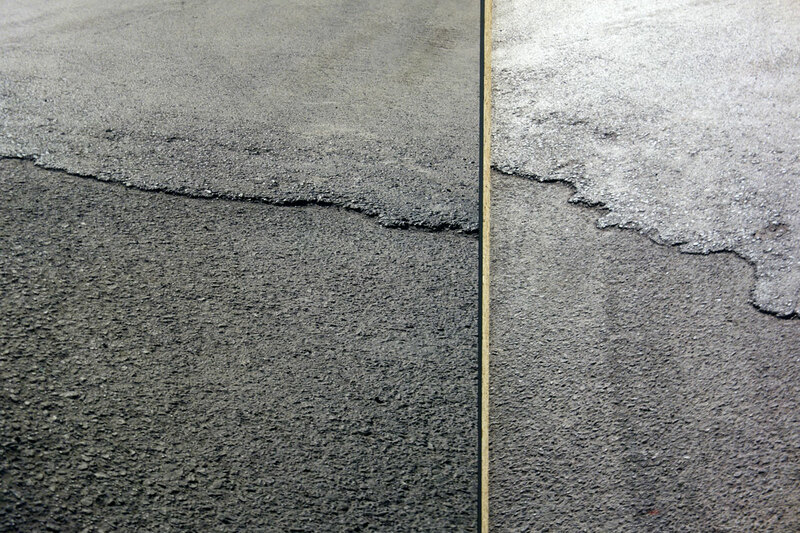 Tides I, II and III 2012 is a series of three photographs of converging layers of asphalt from which the sample has been taken. Together, these images detail a common surface so ubiquitous we cannot value it as rare or particular. And yet these images record a very specific piece of ‘ground’ or earth, just as they also suggest a vast aerial view, perhaps the meeting of two oceans. Photographer Laurence Aberhart is drawn to the edge of dominant historical narratives, creating archives of built and monumental forms particular to certain places and periods of time. He returns to these chosen subjects repeatedly. 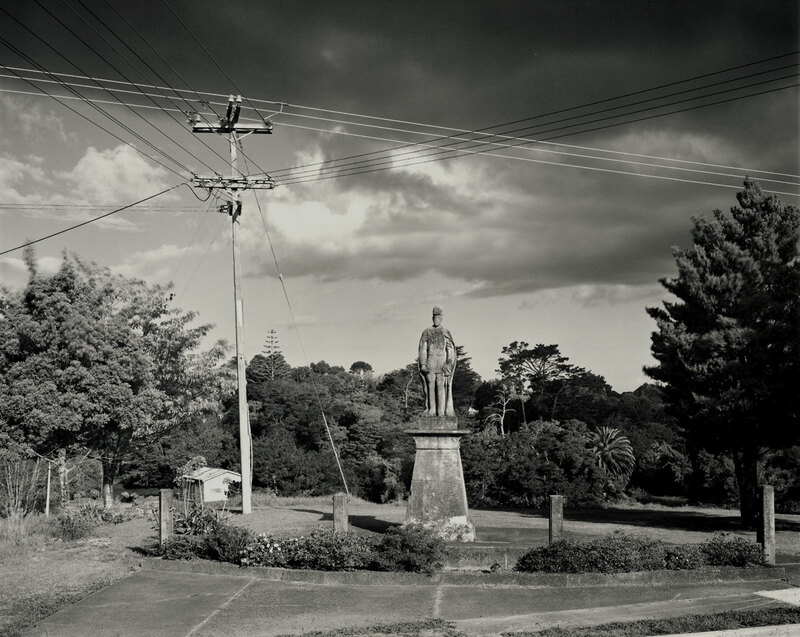 His photographs of the ANZAC memorials of Australia and New Zealand have been taken over the past thirty years. 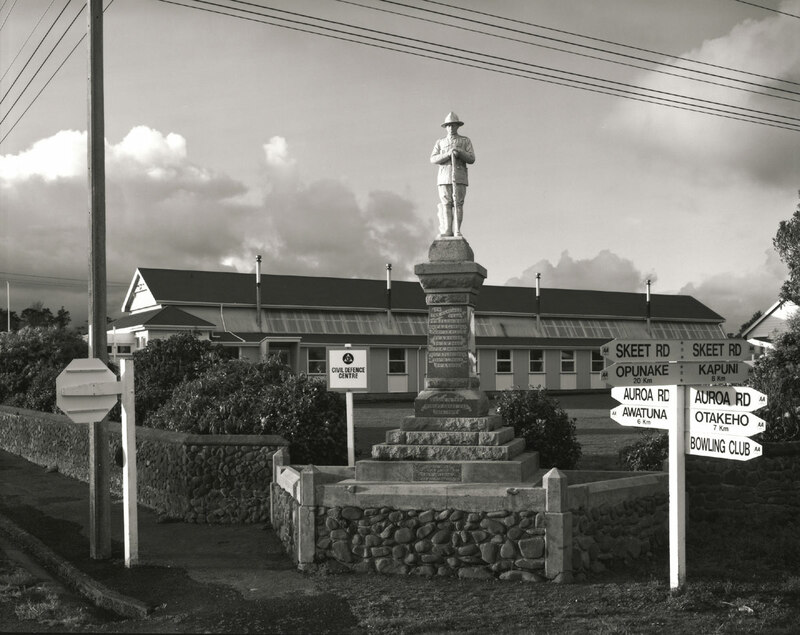 Familiar across both countries, the memorials were built after the First World War to commemorate those who served with the Australia and New Zealand Army Corps. Very few families were able to visit the graves of those who died, and so these monuments served the bereaved as well as larger national concerns. As we approach the centenary of the war, these memorials are the focus of greater attention, yet what they mean is difficult to lock down. 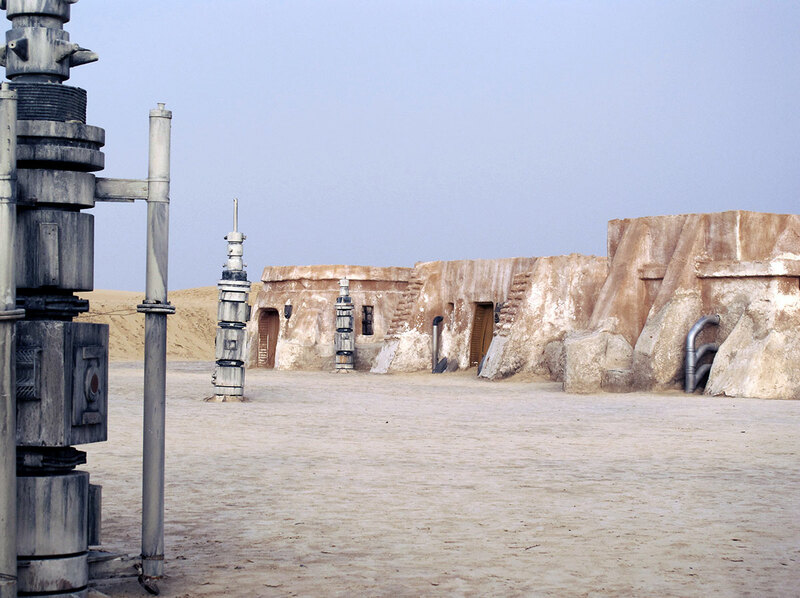 In these images the single figure on each column is a fixed point against landscapes in states of constant change. Saskia Doherty poetically references the Samuel Beckett play Footfalls, expanding on an image of famed American palaeontologist Dr Barnum Brown discovering a dinosaur footprint with texts and concrete sculptural gestures, describing the footprint as “a vastly preserved index of a life”.